The new Illinois law banning shark fin went into effect on New Year&apos;s Day, but you can still legally eat shark fin soup in Chicago&apos;s Chinatown today. If you already had shark fin before January 1, 2013, you "may possess, sell, offer for sale, trade, or distribute a shark fin" until July 1, 2013, so eat up. 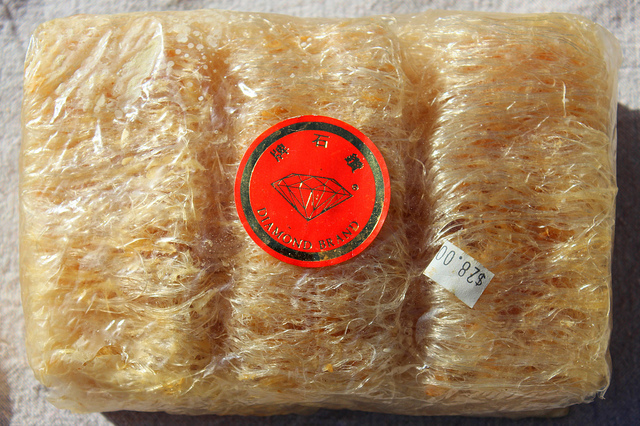 The package of dried shark fin you see above is "20 or 30 years-old" according to its owner, who received it as a gift, and has no plans to ever cook or eat it. I have eaten shark fin, in soup at Chinese banquets in this country and as sushi in Japan, but have never ordered it myself. There&apos;s not much taste, with a texture like al dente cooked mei fun (rice vermicelli), the key ingredient in the Hong Kong diner classic Singapore noodles. The primary appeal has been status, accorded by a relatively high price. At Lao You Ju, one bowl is currently listed on the menu at $16. But at Benu in San Francisco, chef Corey Lee created a "shark&apos;s fin" soup using faux fin made with hydrocolloids. They&apos;re ingredients found throughout our city, with our masters of modernist food. Lee&apos;s soup features a black truffle custard, with Jinhua ham (the jamón ibérico of China), and Dungeness crab. 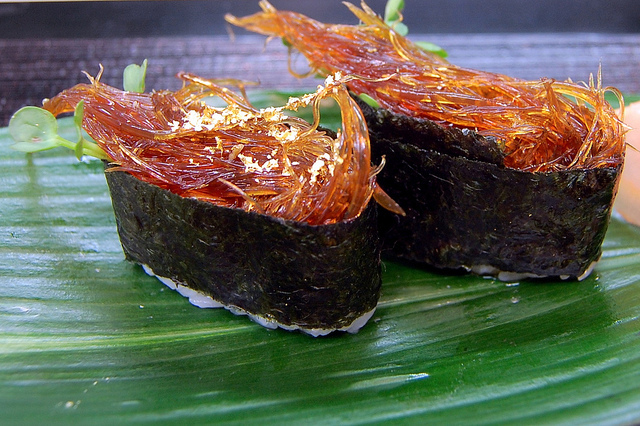 Even the shark fin sushi master I met in Japan won international acclaim with a vegetarian, seaweed version of his most famous creation. Despite our new local ban, and a campaign starring Chinese NBA star Yao Ming, photos of shark fins drying on a Hong Kong rooftop were posted by photographer Gary Stokes, also on New Year&apos;s Day. Which makes me wonder: Could Chicago chefs help save sharks worldwide?